One thing is for certain: time changes things. Whether it’s people or fashion trends, change is the one thing we can all count on. And there is no better example to prove this than to look at children. From babbling babies to busy toddlers, from the terrifying teenage years to (hopefully) mature adulthood – and along the way, their likes and dislikes (along with moods) certainly go through transformations as well. Today we’d like to reminisce about those younger years: those carefree times when Mom and Dad were in charge of responsibilities and our biggest worry was passing the Algebra test at school. 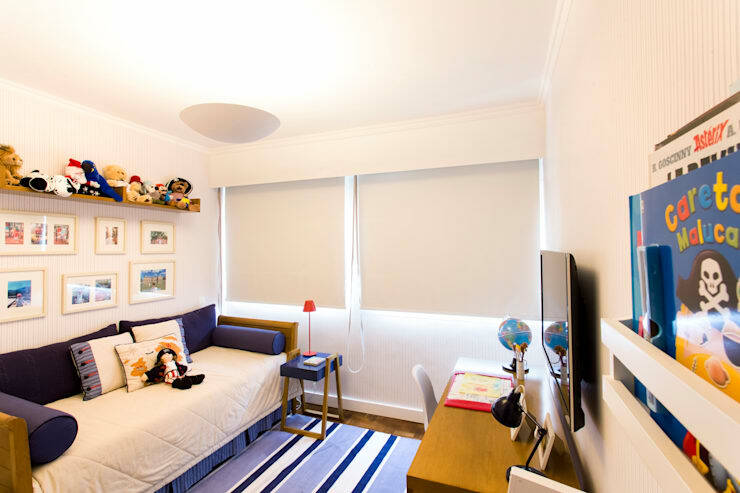 And to take us truly back to that age, whether it was a time of building blocks or pimples, we have selected some delightful ideas for children’s rooms. Regardless of your current taste and style, you are sure to find something here that will satisfy your growing youngster – or, at the very least, the child that is still inside you! Were you a music lover as a teen? Posters of rock stars are a common trend among the young, but just see the delightful route this teen’s room took to commemorate his/her love for rock & roll. We just love how the shades of grey, black and white form a harmonious flow throughout the room. 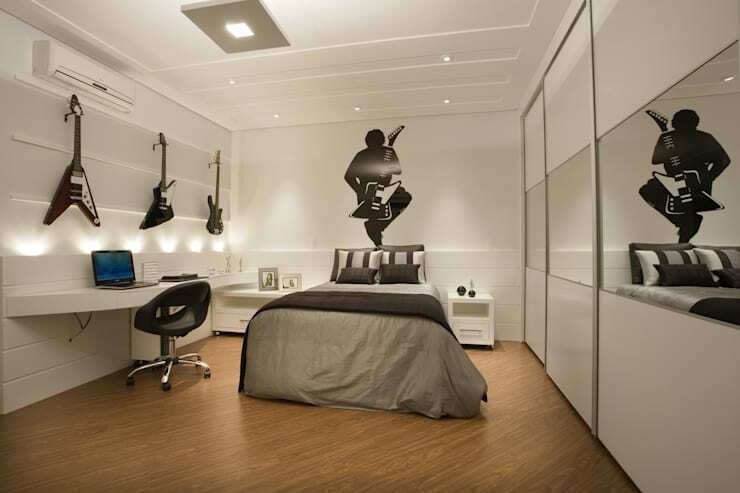 Hanging guitars form the wall art and, together with that fantastic silhouette above the bed, transforms this room into a space that is simultaneously modern and cool for the younger generation. Rock on! What could be more appropriate for young boys than blue tones and cars? How about combining them both into a stylish, modern bedroom to show off to his friends? Blue never goes out of style, and as shown here, can look super cool when dominating a child’s room. Want those blue tones to stand out even more? Add some contrasting colours (such as reds and yellows), lending a dynamic look to the space. And as colour psychology teaches us, blue is known for its relaxing properties. From hardy boys to delicate flowers, see how to decorate: A Girl’s Bedroom Fit For A Princess. For this example we step back quite a few years, back to when ruling the kindergarten playground was at the top of our priorities. Toys and decor in the right colour are important, but just see the difference the right wallpaper can make in a room. As shown in our example above, it needn’t be very colourful or bright, yet when it mirrors the dominant tones used in the room, it can work a treat (such as the blue in the bedspread, the orange in the chair, etc.). A fabulous way to spend those transitioning years from toddler to youngster. 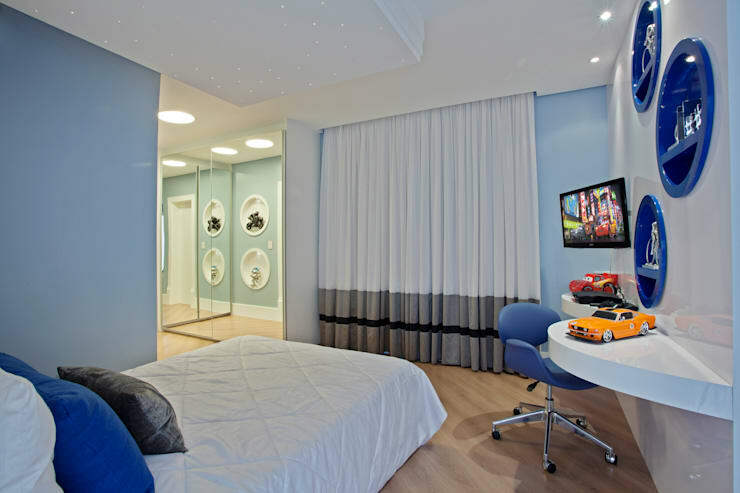 A lot of people think that children’s bedrooms are synonymous with explosions of bright colour. Not necessarily. See the modern route this bedroom went, with a great combination of vivid tones and neutrals. This transforms the room into a space that is quite modern, yet still very much childlike. The whites and blues create a perfect harmony, while the multitude of decorative elements (toys, pillows, books, globe, etc.) add the colourful finishing touches that is still vibrant, yet doesn’t look like an exploding rainbow. From a modern space that showcases lots of decor and toys, to a room that likes to keep it on the down low. 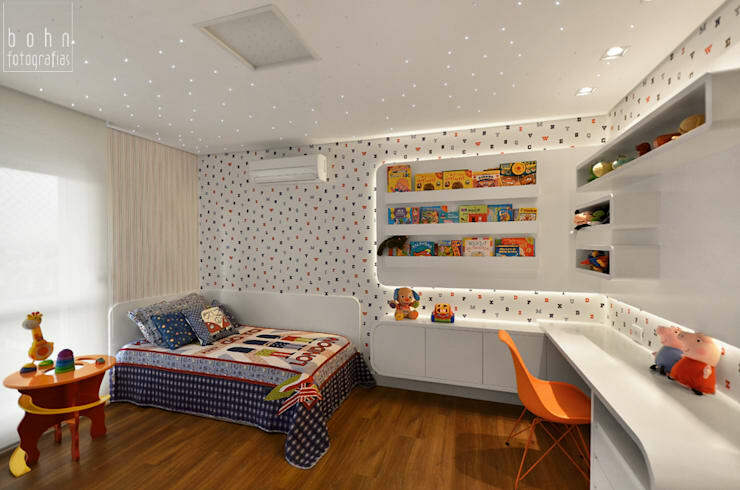 This room is decidedly more mature than our previous example, and can be the ideal space for the little ones transitioning into adolescents. The cool tones mix quite effectively with the neutral colours, creating a vibrant yet stylish harmony. 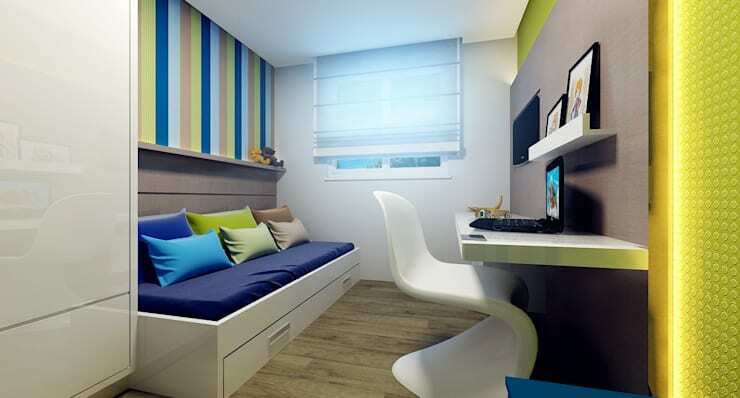 And the addition of a modern bed, desk and chair boosts the room’s cool factor tremendously. Truly a room that any interior designer (and the cool kids at school) can be proud of. 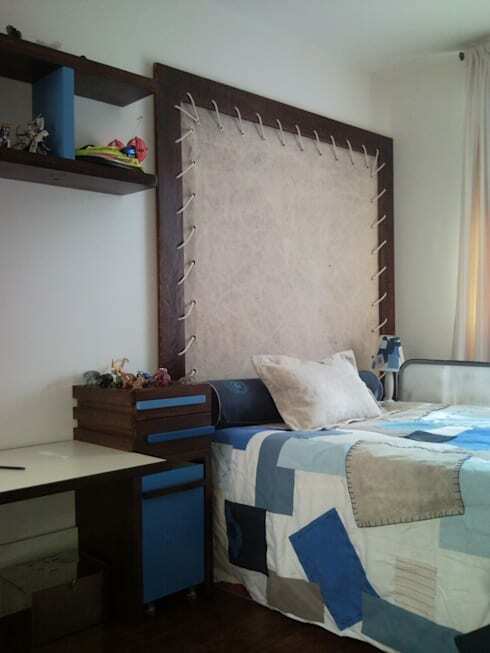 Brazilian designer Ana Adriano shows us this great example for the youngster with an extensive range of interests. 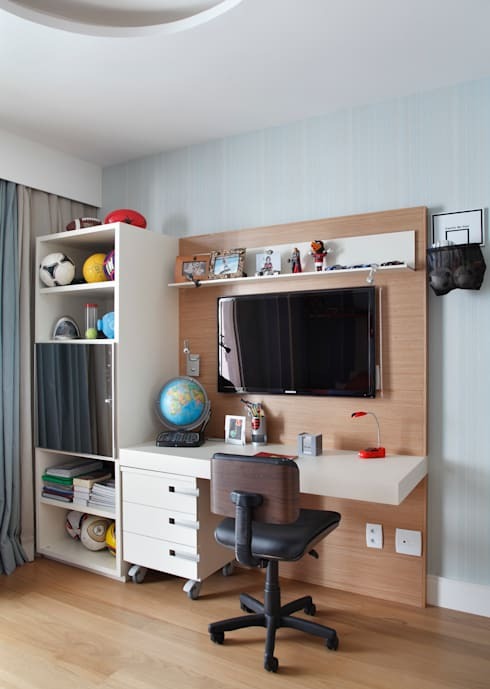 From sports and travel to books and stories, this space presents the ideal elements for the kid who likes to excel. As structure is important in any young person’s life, we thought it’d be a great idea to provide just that in the form of a sturdy and striking desk (perfect for homework time). Add some drawers, storage spaces and display surfaces, and we have the perfect addition for any child’s room. And having it in neutral tones means that any background colours (from hot pink to royal blue) will blend in stunningly. Feed your little one’s crafty imagination with this stunning decor. That bedspread with its quilt-like qualities, together with the headboard, presents a unique eye-catcher that is both artistic and modern. Add to that some supreme colour choices (neutrals fit wonderfully with blues), and you have the ultimate bedroom for a little creative genius in the making. From youngsters to adults, see homify’s magnificent collection of bedrooms – available in a diverse range of styles, colours, etc. Which idea would your child love? Let us know in the comments!